Summer 2017…what a summer! We completed our second fully immersive exhibition, ‘Journey’. Months of planning and preparation, weeks of hard work and dedication resulted in a phenomenal exhibit. Families, friends and colleagues visited from miles around. Below are a few snippets, starting with an Educate Magazine publication, of our fantastic ‘Journey’. Pupils from Rudston Primary School along with their families and community came together to produce an exhibition based on the book ‘Journey’ by Aaron Becker. 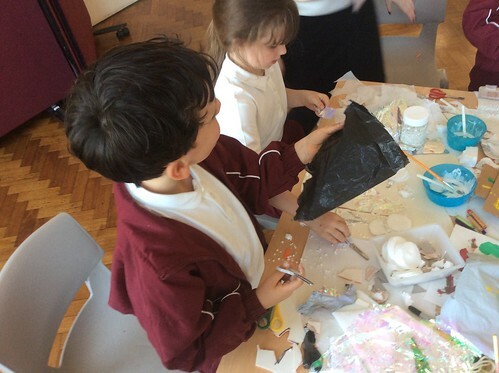 Headteacher, Miss Wendy Walters, said: “The exhibition was an immersive set that exhibited every child’s piece of writing and artwork in a multi sensory way which included music the children had written in response to each page. “It was a journey through a child’s bedroom, woodland glen, waterfall, castles, a hot air balloon ride, a cage, magic carpet ride ending back through the door to the street that the character lived in. “Each year group took a different aspect of the book to study in depth and to represent in the exhibition, through their English focus work, visits, visitors and experiences. 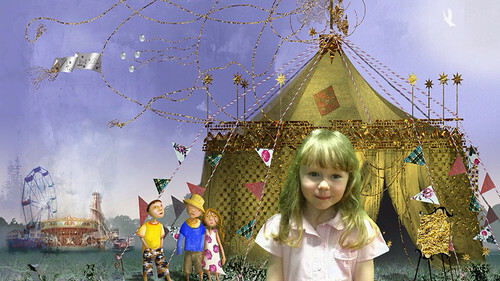 Summer 2016 saw a fantastic immersive exhibition…all of Rudston’s family worked hard to transform the school in to a magical place: The Place Between. Below is some of the media created and gathered throughout the project. Using a green screen, we became part of the adventure ourselves! Every class has had a chance to jump into the Place Between themselves – via our Immersive Learning Suite. Following themes of the book, we’ve explored: circus skills; shadow puppetry; movement to music and looked at strange musical machines, developing our oracy skills and creative expression at the same time. Last year, Rudston Primary School achieved the Gold Reading Quality award and results in reading rose across the school. In order to sustain the improvements in reading and to improve outcomes in writing across the school, we endeavoured to work together to create an inspiring whole school shared focus. 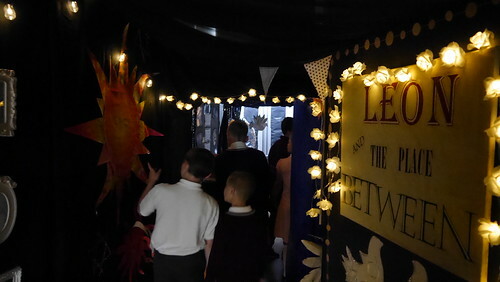 The main whole school focus was a shared collaborative English project based on the text of “Leon and the Place Between” (a beautifully illustrated text which was accessible for children from Nursery to Year 6) which culminated in an immersive exhibition to share every child’s writing and art work. Adopting an Everybody writes approach we audited our current writing provision, evaluated our learning environments through learning walks with colleagues from other schools and agreed on an action plan. We wanted our children and staff to be excited to write and work with a range of partners to investigate and share best practice. Our staff worked with all the professionals named above and visited a range of other schools throughout Liverpool, Knowsley, Halton and Cheshire to look at good practice in English. We visited and drew on the experience of Helsby Hillside in particular to inspire our response as a staff team. The staff team also undertook training in Writing, Reading and SPAG. We undertook these steps in order to work together to improve the writing processes and enjoyment for all our children and families. This culminated in our whole school multi-sensory experience to share the written and creative work of the children, families and staff in response to Leon and the Place Between. We engaged a core group of staff, taking into account the specific strong skill sets of our team – writing, artistic and creative, music, design, display and set building. All of our school team supported the project with great enthusiasm and commitment to make it the best it could be for our children and families. Each year group took a different aspect of the book to study in depth and to represent in the exhibition, through their English focus work, visits, visitors and experiences. Information booklets reinforced home learning for writing and invited family responses to include in our exhibition. Our core team designed, built, created a space and music into which all the staff incorporated every child’s writing and creative work to create a magical space. 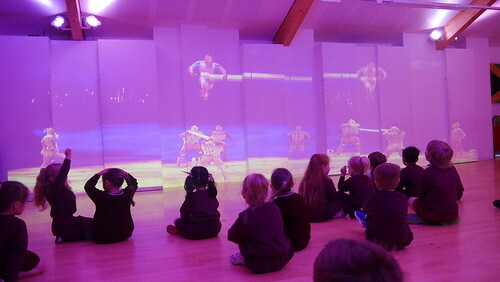 Children, parents and staff were able to engage creatively with a range of experiences that this project provided in order to produce a multi-sensory experience for the school and local community to enjoy. 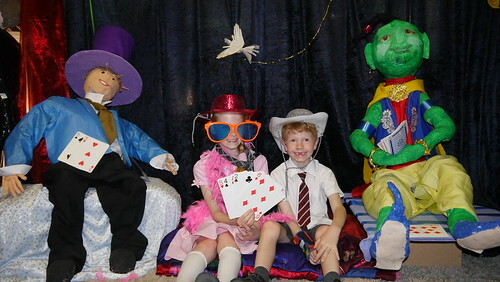 On the 2 evenings of the exhibition the excitement was palpable, Mr Do entertained the waiting families by clowning around, whilst stilt walking, travelled companions worked with children from Year 5 to welcome people into the exhibition and performing in the musical section, one of our ex pupils came to perform card magic tricks inside the magic potions section, one of our Dads provided Candy Floss and our staff worked hard to keep the refreshments flowing. A poetry competition was held across the school and the winners were invited to perform their poems in front of the green screen. The finished piece was shared on the interactive whiteboard at the exhibition. A range of poetry styles from acrostics to haiku to diamanté were amongst the winners. The winners all showed an aptitude for performance poetry! 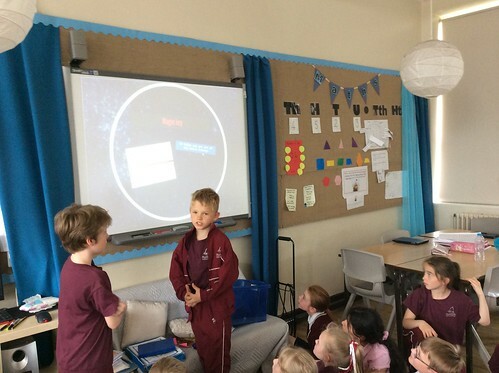 All our children in school visited with their Buddies, from nursery to year 6 they visited together and shared their work with each other raising self-esteem and pride in their own writing and creative responses. Across the education community we had visitors from the School Improvement Team, Hope University, Story Barn, teachers from schools in Liverpool, Halton, Knowsley and Helsby Hillside. Our feeder nurseries, secondary school partners and local schools were invited to visit the exhibition to share the quality of work achieved by the children. Our neighbours and local Councillors came to visit and celebrate our children’s talents. It provided opportunities for children to take part in magical learning experiences and to apply their reading and writing skills in a creative context, reinforcing the areas of the national curriculum across reading and writing. The shared focus on teaching and learning in writing, working with and learning from others has impacted on the daily learning and practice in class. Each classroom has a ‘Spelling Stop’ to support SPAG and writing at the age appropriate levels and encourage children to have fun whilst trying to extend their skills and learning. Writing opportunities have been planned, prepared and engaged the whole school in different fun experiences including The Nest a science and writing project, which we also shared with Sudley Junior school to improve writing and encourage learning in the outdoors. Opportunities to work with artists, set designers, theatre actors, University Tutors and trainees, colleagues from a range of schools across the region have raised the outcomes and passionate enjoyment of writing across the school. When asked what they were most proud of a lot of children replied that they were most proud of their work done at home with their families, which is an impact of involving families in the learning.